My first visit to the Maldives was in the ’90s and since then I have returned every year since 2013. A total of five visits. The Maldives is a special place for me. It has a completely unique environment and I thoroughly relax and I enjoy chilling out in the peaceful atmosphere and beautiful scenery. The De Havilland Sea Otter is one stylish aircraft. Individual infinity plunge pools are a nice touch. The endless horizons make for spectacular sunsets. 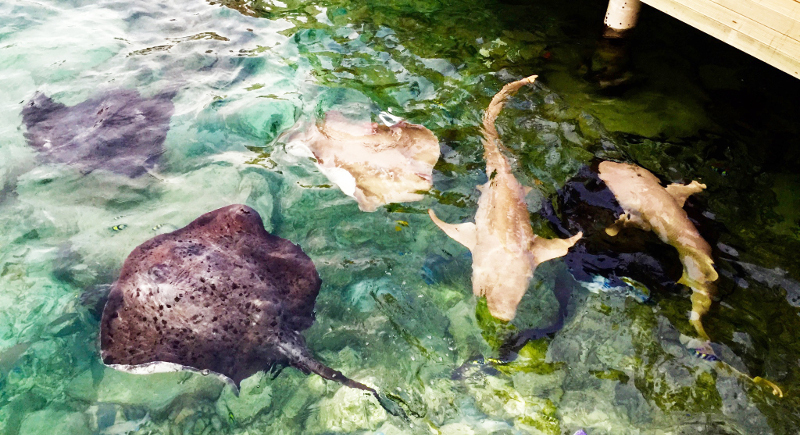 Go shark and stingray feeding at the dock. Barefoot by the pool, the essence of relaxation. With a rich culture, gorgeous vistas and spectacular marine life, it’s one of our favourite destinations. We quickly adopt a “life is good” attitude of total relaxation and enjoying being away from our usual routines – it’s what draws me back year after year. 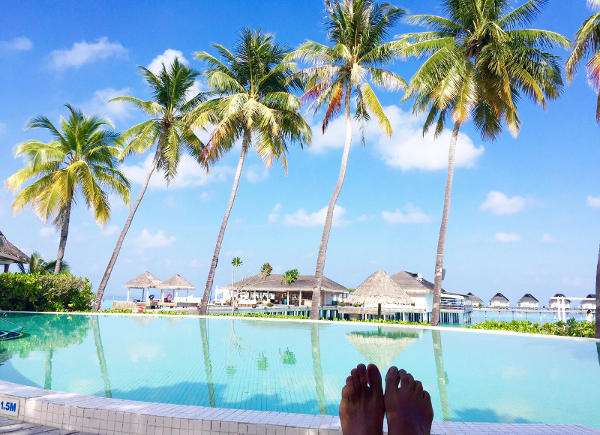 I can truly say that the Maldives is a brilliant holiday destination, one of the best. With 1,190 islands, land is still the scarcest resource in the Maldives Archipelago, making up less than 1 per cent of its surface area and it is one of the lowest lying countries in the world. My choice of hotel for the last four years has been the Centara Grand. Being a former hotelier I know there’s nothing like the personal touch. When you are staying in a hotel as a recognised regular guest, it’s extra special. You get a sense of belonging; a sense of family. A special kind of relationship between you and the management and the whole team. It is something quite unique and this is absolutely the case with the Centara Grand. 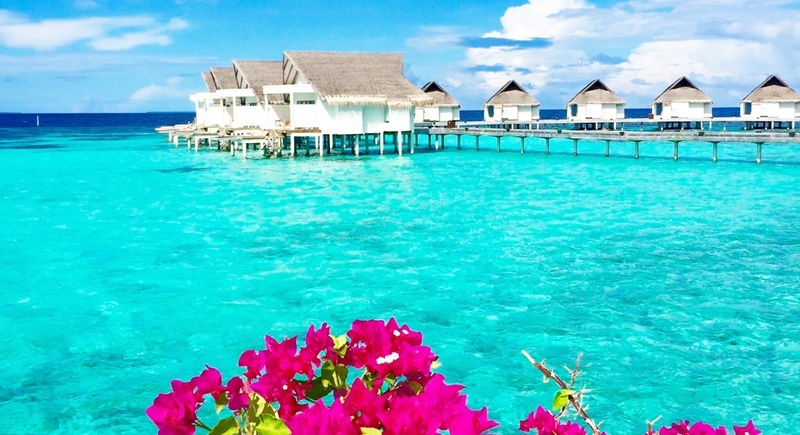 Travelling to the Maldives could not be easier. 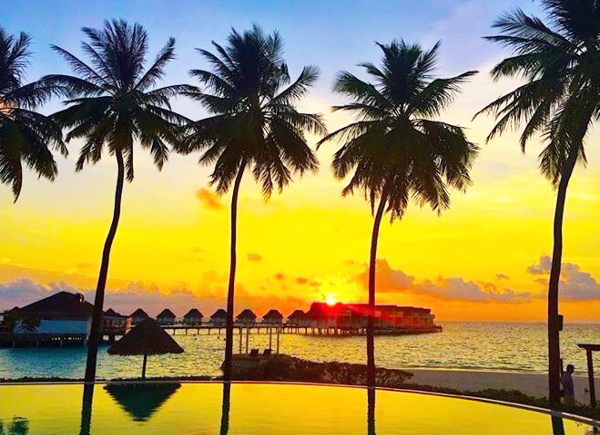 Travelling from Bangkok with my partner Pichai, we boarded a direct flight to the International Airport in Malé, the capital and most populous city in the Republic of Maldives. It takes just four hours and 15 minutes from Suvarnabhumi Airport with Bangkok Airways. 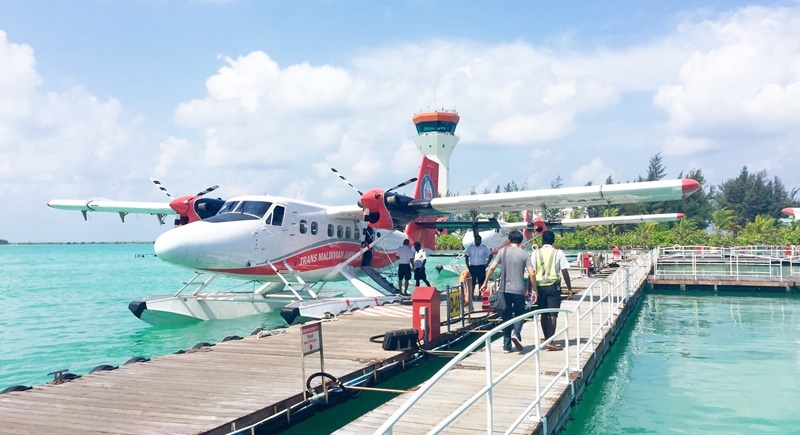 From Malé it’s just a short 25-minute hop by seaplane to the resort. You don’t need that much luggage in the Maldives, so pack lightly. Staying at a beach resort, you spend much of your time in shorts and T-shirt and quite often for me, as the title suggests, barefoot. Just perfect. I just love seaplanes. Arriving at the resort aboard a twin-engined De Havilland Sea Otter is very special, an experience not to be missed. It’s a great way to arrive, stylish and fun. There is no strict dress code for the restaurants, except swim wear is not allowed and in the evenings you have to cover up a little more than lunchtime. Not a problem as most guests wear something loose fitting anyway due to the temperature. Cotton seems to work best. Bring lots of reading material (there is a library if you forget or run out) and your headphones (if you like to listen and relax to music, as I do). The resort has many daily activities with boat trips to nearby islands; fishing trips and sunset cruises with dolphin watching. Over the years it has been interesting to watch the development of the resort. The Centara is no stranger to change. Improvements evolve gradually, but without ever losing the designer’s original concept for the resort. It has improved organically and with care. The inclusion of 20 Sunset Ocean Pool Villas has been so successful they are often sold out. 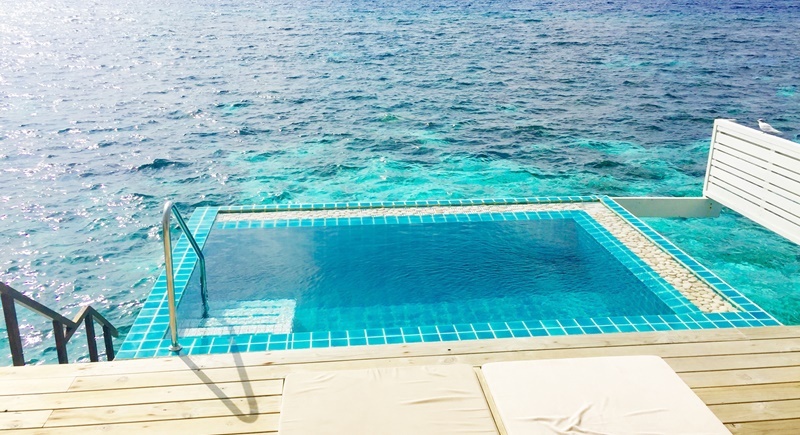 They incorporate a small horizon-less plunge pool in the balcony of the villa and it’s a perfect place to soak and relax, especially at sunset with the fabulous colours above the turquoise sea. The low-lying landscape provides some of the most brilliant sunsets you will ever see. Taking in this view with a cocktail in your hand is just magical! Dining at the Centara is a delight. The resort is family friendly so there is a wide choice of dining options. We particularly enjoyed eating at the Island Club. A fine dining restaurant with a great kitchen, it’s special and relaxed. The menu changes daily for lunch and dinner and the service is faultless. Being a Thai-owned resort, it comes as no surprise that the resort caters for lovers of Thai cuisine. Arguably the fastest growing global culinary trend, Thai cuisine is a huge phenomenon and the resort’s Suan Bua (lotus pond) is a wonderful Thai restaurant with an exceptional Chef – Khun Ning. We ate regularly here during our two-week vacation. Alternating between Azzura Italian Restaurant and Reef, the international buffet restaurant with its popular teppanyaki counter. The resort is all-inclusive, which at first, four-years ago, worried me. But I needn’t have worried, the food is fabulous. You can completely forget about taking your wallet anywhere in the resort. You never need to figure out your spending – it’s all included – which makes going to bars and restaurants trouble-free and most importantly, stress-free. The island is packed with water sports: snorkelling, paragliding, banana boats, mini water slides, a supervised kids club and a scuba club. On top of this are daily activities such as spa treatments, kids’ fish feeding, shark/stingray feeding and a recently introduced yoga programme with the extraordinary Dr Raj. You can learn to scuba dive at the resort, starting with an intro course that is included in the resort package. Also free are fishing and sunset cruises with dolphin watching. There are also regular diving trips, for the more experienced diver, which do cost extra. For me the top activity is swimming with whale sharks. They are called sharks but they are actually the world’s largest fish and are plankton eaters. The trip consists of a 45-minute boat ride to the area where the whale sharks might be feeding and once spotted, snorkelling for 30 to 45 minutes in the general area. Growing up to nine-metres long, these majestic creatures gently swim along, giant mouths open, as we watch in awe at their immense power and beauty. This is probably on my list of top 10 things to do in the world, such a unique and extraordinary experience. What else to do? Well for me quite often, nothing. (How often can you do that?) You are in charge of your own time, you’re on holiday, so relax. Lay back and soak up the good karma, which is so easy to do as there is so little to cause you stress.